1) The Jets trade 5 players, including 2 defensive starters for the rights to a 1-year Major College QB. 2) Mark Sanchez captures the hearts of the die-hard Jet fans and his veteran teammates while seizing the starting job in camp. 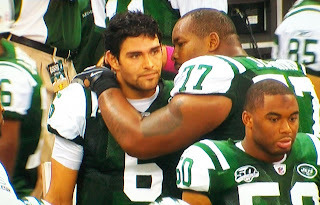 3) Sanchez is praised for his poise and presence as the Jets take off to a 3-0 start. But there were red flags along the way. Sanchez threw the ball up for grabs too many times, though he was rarely punished by opposing defenses. He also carried the ball recklessly, both in the pocket and on the run. And again, he mostly had gotten away with it. Yesterday in New Orleans, it all caught up to our Golden Boy. Four turnovers, two of which led directly to Saints TDs. And it's a shame because the defense shut down Drew Brees and the League's #1 offense in a 24-10 loss. Nobody wants to take away Sanchez's bravado, but he needs to make better decisions. This week his decisions cost the Jets on the road against a tough opponent. If he doesn't straighten out his act soon, it will cost the Jets in a game they're supposed to win. And then it will cost them playoff seeding. And then he may wind up having to watch and learn from the bench.